When we were in Denali National Park over Labor Day, one morning we rode the bus from our campsite at Teklanika past Polychrome Pass, then asked the bus driver to let us off so we could go for a hike. A young Dutch couple also left the bus at the same time, and we chatted a bit before we went our separate ways. They were headed out for an all-day hike, sure to reach the top of some of the nearby peaks. Dan and Meredith and I would mostly stick to the gravelly river banks, with only a little steep traversing and scree slope descents, and we would also catch the bus back not long after our picnic lunch. Although we wouldn’t get a chance to hike together, Bianca and Nathan seemed like lovely people, so we invited them to come over for drinks and snacks in the evening when they returned from their hike. Sure enough, they were out all day, but came to our campsite afterward and we shared Alaskan carrots, potato chips, and wine. We had a delightful evening, and got to hear about their adventures in Alaska so far, and the places they still planned to visit on the remainder of their three-week vacation. They were really getting all over the state—including McCarthy, Denali, Granite Tors, Chena Hot Springs, and they were headed for the Kenai next. They would come back to Anchorage to stay in a hotel on their last night before they flew home, so we told them to call us when they returned and we’d pick them up and have them over for dinner. We were pleased that they took us up on our offer, and enjoyed their company for dinner on their last night in Alaska. As we were talking about Holland, I remembered a couple of Meredith’s books about ice skating—they are both set in the Netherlands. One book, called A Day on Skates, is a nostalgic story of a group of school children skating on the frozen canals. Our favorite is called The Greatest Skating Race, a World War II story from the Netherlands. It tells all about the Elfstedentocht (the Eleven Towns Race), which can only be held in those winters that are very cold—cold enough to freeze the canals that connect eleven towns in northern Holland. When they came over for dinner, I wanted to make a nice Alaskan-themed meal… how about making fish sticks out of the halibut that Dan and Meredith caught earlier in the summer? I served the fish with my favorite green salad: the one with peaches, almonds, and a honey-balsamic vinaigrette. Here’s one of my favorite things to do with halibut. It’s fantastic when the fish is fresh, but it’s also great with frozen fish. My mom used to make this a lot, except she didn’t use quite as much garlic, so use your own judgment. For a summertime feast, serve great mounds of these fish sticks accompanied by a huge bowl of peach-almond salad with honey-balsamic dressing, depending on what fruit is in season. You won’t even need dessert—just eat more salad! whole wheat bread slices, stale or fresh (but not dried hard), processed in a food processor into bread crumbs. I like to use whole-wheat sourdough bread from our Rise & Shine bakery, but any hearty bread will do. 1. Preheat your oven to 400 degrees. 2. Crush 4 or 5 garlic cloves into a shallow bowl. Add a ½ teaspoon or so of salt and mash it into the garlic with a fork. Add about a ½ cup of oil and stir until well-combined. 3. Pour a cup or so of the bread crumbs into another shallow bowl. 4. Using a fork, dunk each halibut piece into the garlicky oil, drain for a second, then drop it into the bread crumb bowl. Coat thoroughly with bread crumbs and transfer to a baking sheet. 5. As you run out of oil and bread crumbs, refill the bowls and keep going (you don’t need to add more garlic and salt—just refill the oil and mix well). 6. Bake the halibut for about 7 or 8 minutes, just until the fish flakes. This will depend on how thick the pieces are. Don’t overcook them, or they will be dry. 7. Serve with lemon wedges and a big salad. Yesterday was Meredith’s first full day at the farmers market—usually, she’s at her babysitter’s house on Saturday mornings, but Becky was busy this weekend. (More about fabulous Becky in a future post.) Since our other babysitters were out of town or otherwise engaged, we resigned ourselves to bringing five-year-old Meredith with us to the market. It seemed like a good idea to try it out, since when school starts in mid-August, our babysitters will be much busier with sports and other activities. Could we pull it off? Dan and I sell our Rise & Shine Bakery bread at the market on summer Saturdays from 9am until 2pm. During the first few hours of the market, we’re pretty busy slicing samples and selling the bread as fast as we can—helping people decide what flavors will go best with their dinners that night, how many loaves to buy to freeze before that flavor comes around again, or what pan loaf their kids might like best to eat in sandwiches. 7.	did I mention the snacks? 6.	cup of those awesome Kettle crinkly potato chips (!!). Her bike and helmet packed, her nest ready, Meredith slept longer than I can remember in years. I finally had to wake her up at 8:15 so we could drive down and meet Dan at the market, where he had set up our stand already. When the market opened at 9:00, Meredith was zooming around on her bike, visiting the other vendors and doing little tasks like trading bread for cauliflower, zucchini, cucumbers, and tomatoes. I was so pleased that she remained cheerful all morning—some of the time in her “nest” and sometimes biking around, doing laps. The mornings always fly by for us while we sell bread, and I was so glad I didn’t have to try and entertain her while waiting on customers. Then, near the end of the market, our friend Terri came back by the market (she had bought her bread earlier) and asked if Meredith could come to the zoo with her! It was such a cool, cloudy day that her hiking partner for the day had backed out, and she wanted to go to the zoo… but her kids are 19 and 22 and were not interested in joining her. And everyone knows that it’s more fun to take a kid to the zoo than to go alone! What a lovely surprise for Meredith, and for us! Thank you, Terri! Like I said. Plenty of snacks. And like my mother always said: “It’s a wise mother who knows her own daughter.” And another appropriate old saw: “Like mother, like daughter.” Here’s the supper we made last night from the bounty at the farmers market, for which Meredith and I were, indeed, hungry. Start the salad first, since the cucumbers, onions, and yogurt need to drain separately. Then grill the zucchini, which can happily sit while you set the table, mix the salad together, and grill the salmon. Salting the cucumber and draining the yogurt keeps the salad from getting watery, even if you use nonfat yogurt. If you use full-fat Greek yogurt, you won’t need to drain the yogurt. 1. Put the yogurt into a sieve and let it stand over a bowl for an hour or two in the refrigerator to drain some of its liquid. 2. Halve the cucumber and scrape out the seeds with a spoon. Slice each half into strips, then cut into small dice. Finely dice the onion. Put the cucumber and onion into a sieve or a colander, toss with the 2 teaspoons salt, and let stand at room temperature for at least an hour, or up to 3 hours. Drain, and press out the extra liquid. 3. Mash the garlic finely in a garlic press, or, lacking that, mash the garlic and salt together in the bottom of a bowl with a fork until it’s a paste. In a large bowl, combine all the ingredients. You can serve it immediately (that’s what I did), but it will develop more flavor if you let it sit in the refrigerator for a couple of hours. It will be good for a couple of days. This recipe is so easy it’s sort of embarrassing to call it a recipe, but just in case you haven’t already discovered this method, I’ll describe it. We eat gallons of zucchini like this in the summertime! It’s great an as appetizer, in sandwiches, alongside soups, in salads, or just cold right out of the fridge, eaten with your fingers. Heat a grill to very hot. Slice the zucchini lengthwise, into planks a little less than ¼” thick. Toss them with olive oil and salt. Turn the grill down to medium, and grill them about 3 minutes on each side, until they have grill marks and are nice and tender. Eat them right away or else eat them later at room temperature. Try not to eat them all right as they come off the grill, or the rest of your family will be annoyed. 1. Skin the salmon filet and sprinkle it all over with the spice rub or salt & pepper, rubbing it on to cover all surfaces. 2. Heat your grill on high heat, and when the grill racks are very hot, scrub them clean with your grill brush. Just before you’re going to grill the salmon, fold a paper towel into a 3” square, and soak this pad in a small dish of canola oil. Swab the grill racks thoroughly with the oil-soaked pad, then immediately set the filet on the hot, oiled rack with the skinned side up (pretty side down). 3. Turn the heat down to medium and cover the grill. Cook the salmon on that side until it has nice grill marks and will release from the grill without sticking, about 4 minutes. 4. Use the same paper towel to oil the nearby grill space, and then carefully flip the salmon onto the newly oiled patch. Cook for another couple of minutes until it’s done to your liking. We like it pretty rare, but keep in mind that the thinner tail section will cook faster than the thicker sections. You can either cut the tail off when it’s cooked and let the rest of the salmon cook a bit more, cut the tail section off before you grill it and cook it separately, or just let the tail part get more well-done than the rest of the filet for those in your family who prefer it that way. 5. Remove the salmon from the grill to a plate. On Friday I went to the Bear Tooth’s Food & Film Festival and saw Food, Inc. The movie was fantastic… touching and inspiring and tragic and hopeful all at the same time. It’s showing again on Thursday, so you still have a chance to see if it you like. Along with the movie, I had an amazing meal of local food! Both the Grill side and the TheatrePub side are doing special Alaskan menus! It was hard to decide what to order—so many amazing choices for the local food fanatic! Luckily I’m going back tomorrow to see another food movie, Fresh, so I knew I would have another chance to order the things that I couldn’t try on Friday. Otherwise, it really would have been embarrassing—I would have had to order everything on the menu! To start, I had the highbush cranberry vinaigrette salad, with beets, kohlrabi, marinated cheese curds, and heirloom tomatoes. Beautiful with the golden beets and their concentric circles… and YUMMY! Then I had the seared barley cake with roasted root vegetables and honey herb drizzle. The barley cake was tender but toothsome; rich, savory and delicious, with little nuggets of mushrooms in it. And of course the roasted vegetables alongside were sweet and wonderful! Then I was extremely lucky that my friends Susanne and Thomas both ordered the Alaskan carnita plate. It was made with Alaskan pork, and served with whole beans, tomato-cumin brown rice and tortillas, salsa, and sour cream… I got to try their pork, and it was fantastic: crispy and perfect on the outside, tender and moist on the inside. The Grill has really got it figured out! So, are you dying to know what I’m ordering tomorrow? Maybe not, but I’ll tell you anyway. I’m definitely going to try the roasted carrot soup, and I think I might try the blackened salmon lettuce wraps (with cabbage, sprouts, carrots and green onions) off the TheatrePub menu… (Did I mention that you can order either the TheatrePub food OR the Grill food when you eat in the movie? Just order from the “to go” desk.) But the Grill’s halibut with birch glaze looks so yummy, too… Hmm. This might get embarrassing after all. In honor of the Bear Tooth’s wonderful effort to promote and provide local food for us, along with the Alaska Center for the Environment’s hard work to make this fun film & food event happen, I invented a new salad tonight. Since it’s using ingredients that I had hanging around the house (so what’s new? ), I’m hoping that trying this recipe is easy for you, too. We had Alaskan beets from our Alaskan Glacier Valley Farm CSA box, and Dan sliced and roasted them up a couple of days ago (am I well-married, or what?). We also had some beautiful Alaskan green & red leaf lettuce left over from last week’s box (have you ever noticed how long lettuce lasts when you get it in a CSA box or from the farmers market?). I almost always have at least a drizzle of my mustardy, garlicky red wine vinaigrette in the fridge, and tonight was no exception. I remembered reading in my rebar: modern food cookbook about the author’s Polish heritage, and how beets, sunflower seeds and dill are familiar flavors. So I sprinkled some dried dill into my vinaigrette (what the heck, why not?) and toasted up some sunflower seeds. We served it up with grilled salmon (Alaskan, of course, out of the freezer) that Dan rubbed with Halibut Cove Dill Rub from Summit Spice & Tea Co. I don’t know what else is in the rub other than dill, but it’s salty and tasty! Clearly, this is no traditional Polish meal, but it was fun to take some of the flavors and go with them. They were great! I make a lot of this dressing at once, without the dill, and then keep it in the refrigerator to use all the time. It keeps really well, is yummy and creamy without any eggs or cream in it (mustard is the emulsifying agent), and is great with a variety of different salads. Take out several spoons-full of the dressing and add a couple of pinches of dried dill, or big pinches of fresh dill, chopped. Stir it in and let it sit and let the dill flavor the dressing while you make the rest of the salad. Even if you’re not a beet fan, I think you’ll love these slices. If you’ve been wondering what to do with the beets in your CSA box, here’s the ticket! 1 pound of Alaskan beets—the biggest you can find. 2. Peel the beets and slice them into thin slices—I did about 1/8-inch slices in my food processor, but do whatever you like. 5. Toss the beet slices with olive oil and salt. 6. Spread the beet slices out in a single layer on the baking sheets. Roast for about 30 minutes, or until they are cooked and tender when you stab them with a fork. Toss the salad greens with dressing to your taste. Put a big pile of salad on a plate and top with the beet slices. Sprinkle toasted sunflower seeds over the salad and serve. To see an easy recipe for grilled salmon, check out this link for grilled southwestern salmon. Just substitute the dill rub or just use salt and pepper instead of the southwestern spice rub. You probably already know that I sell my Rise & Shine Bakery bread at the South Anchorage Farmers’ Market during the summer. As the farmers’ market reporter, I also write the weekly email newsletter that gets posted on our website. A couple of weeks ago two women from Trout Unlimited contacted me about holding an event to promote Bristol Bay salmon at our farmers’ market. The event, “Eat Wild!,” is to be held this Saturday, June 27, and is designed to build consumer demand for wild salmon. By building support for the fishery, they hope to help protect Southwest Alaska’s Bristol Bay watershed from the threat of large-scale mining. Trout Unlimited, partnering with our Arctic Choice Seafoods, will be giving away free samples of grilled Bristol Bay sockeye salmon along with recipes and information about Bristol Bay and the risks this fishery faces. They asked me if I wanted to submit a recipe for their event—and I just happened to have a great recipe ready! At the market last weekend I picked up a glorious sockeye salmon filet so I could make it again and take a photo for you. YUM! I’m definitely planning to pick up another salmon filet this Saturday! You can feed yourself like a King (pun intended) and get yourself on the moral high ground—just by buying wild Alaskan salmon! The event is from 9 a.m. to 2 p.m. at the Arctic Choice Seafood booth at the South Anchorage Farmers Market, at the Subway/Cellular One Sports Centre near the corner of Old Seward Highway and O’Malley Road. More information is available at www.whywild.org. This recipe is inspired by the wonderful fresh local salmon at the market! You grill the salmon with a yummy southwestern rub, then toast a slice of hearty whole-grain bread until crisp. Spread the toast with a thick layer of guacamole, stack the salmon on top, and sprinkle with a little garnish of red onions. Serve with a simple green salad, topped with toasted green pumpkin seeds. And wouldn’t a margarita taste good with this meal? Especially if we have a sunny day and you can eat it outside on the deck! Even if you have your own guacamole recipe already, you might want to give this one a try—it’s modified from a recipe from a Cook’s Illustrated magazine from several years ago, and I really do think it’s a good one. For the southwestern spice rub, I really like the choices at Summit Spice & Tea Co. (at 1120 E. Huffman Road). I’d recommend their southwestern blend, or the Slammin’ Salmon, or the Coho Mojo. You could also just use prepared chili powder if you don’t have any of these blends handy. 1. Make the guacamole, cover it with plastic wrap (pressed directly onto the surface to keep it from browning) and refrigerate. 2. Skin the salmon filet and sprinkle it all over with the spice rub, rubbing it on to cover all surfaces. 3. Heat your grill on high heat, and when the grill racks are very hot, scrub them clean with your grill brush. Just before you’re going to grill the salmon, fold a paper towel into a 3” square, and soak this pad in a small dish of canola oil. Swab the grill racks thoroughly with the oil-soaked pad, then immediately set the filet on the hot, oiled rack with the skinned side up (pretty side down). 4. Turn the heat down to medium and cover the grill. Cook the salmon on that side until it has nice grill marks and will release from the grill without sticking, about 4 minutes. 5. While the salmon is grilling, toast the bread on the grill or in your toaster. 6. Use the same paper towel to oil the nearby grill space, and then carefully flip the salmon onto the newly oiled patch. Cook for another couple of minutes until it’s done to your liking. We like it pretty rare, but keep in mind that the thinner tail section will cook faster than the thicker sections. You can either cut the tail off when it’s cooked and let the rest of the salmon cook a bit more, cut the tail section off before you grill it and cook it separately, or just let the tail part get more well-done than the rest of the filet for those in your family who prefer it that way. 7. Remove the salmon from the grill to a plate while you prepare the sandwiches. 8. Spread each slice of toast with a thick layer of guacamole, top with the salmon, and sprinkle with red onions. Serve immediately with a margarita or a cold beer! I buy bags of avocados all year ‘round at Costco. Here’s how to ripen and store the avocados from Costco so they don’t get overripe and go to waste. Buy a bag of them when they are rock-hard, and set them on your counter. Every day (you must be vigilant), squeeze them very gently to see how soft they are getting. When they have just begun to get soft (don’t wait until they are squishy), put them in the refrigerator RIGHT AWAY—this will more or less arrest their further ripening, and you will have a treasure trove of perfectly ripe avocados for a week or more. 2. Put the garlic, jalepeno, cilantro, salt, and cumin in a medium bowl. 3. Halve, pit, and peel the avocados. 4. Drain the onion well in a sieve and add to the bowl, stir with a fork. Put one avocado into the bowl and mash the flesh with the onion mixture. 5. Cube the remaining 2 avocados into ½” pieces and put the pieces into the bowl. Sprinkle the lime juice over the diced avocado and mix entire contents of bowl lightly with a fork until combined but still chunky. Adjust seasoning with salt and lime juice. Try not to eat the entire bowl while you’re testing it. 6. You can cover it with plastic wrap, pressed directly onto surface of guacamole, and refrigerate it for a few hours before serving, if you like. Many weeks ago we made a plan with Margo and her husband Andy to go camping together on Memorial Day weekend. They planned to go to Eklutna, and we were excited to join them, especially since our four-year-old daughters are great friends. The two girls together are as self-entertaining as you could hope, and Margo and I regularly exploit this phenomenon. Anyway, Eklutna is a beautiful spot, not very far from Anchorage, with huge Lake Eklutna ringed with steep, snow-capped mountains, and lots of trails for hiking and biking. The weather lately has been glorious, and we hoped for nice weather for the weekend. We brought bikes for the kids and for the grownups, the canoe, and hiking and running gear. We figured that if we left on Friday morning, we’d have plenty of time to get a campsite. We figured wrong, though. Every campsite was occupied, and we were crushed! We’d been looking forward to this little adventure for so long, and didn’t just want to go home! We guessed that if we tried another campground farther north, like Nancy Lakes, it would also be completely full. But we had to stay at Eklutna for the day at least, until Andy could finish his work day and drive up to meet us in the afternoon. So Dan went for a bike ride, I went for a run, and Margo graciously stayed with the girls while they sped around the campground on their bikes. I needn’t have worried… when Andy arrived, he had a great idea! We could drive north toward Talkeetna and stay on Margo’s sister’s cabin property! We couldn’t get into the cabin, but we didn’t need to! We had a great time camping in the woods alongside their driveway, sunning ourselves on the dock on the little lake next to their cabin, roasting marshmallows in a firepit that the menfolk constructed, and biking on the beautiful new paved trail along the road to Talkeetna, admiring the views of Denali. One of the meals we ate was this succulent and hearty salad. OK, so it’s not exactly typical camping food—but it was a car-camping trip, after all! This dressing is one that I make a lot of at once, and then keep in the refrigerator to use all the time. It keeps really well, is yummy and creamy without any eggs or cream in it (mustard is the emulsifying agent), and is great with a variety of different salads. 1. 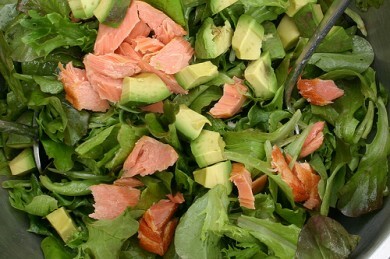 Toss the salad greens with dressing to your taste, then add the avocado and salmon. Toss again. 2. Sprinkle toasted pumpkin seeds over the salad and serve. This time of year I always think a lot about my mom, not just because it’s Mother’s Day, but because it’s springtime, and time to be planting seeds and getting the garden ready. My mom was an amazing vegetable gardener, and this time of year you could usually find her in the greenhouse. I remember the smell of the greenhouse—the rich smell of the dark earth in the big raised beds on each side. In the spring there was usually a faint scent of fish fertilizer, and later in the season, my nose would be filled with the rich aroma of tomato plants. My mom would spend hours each day after teaching school, planting seeds and transplanting little seedlings into bigger pots. She would talk to her little babies, encouraging them to thrive. Later, when school was out, she would spend much of her free time in the garden: weeding, watering, and harvesting, and chatting with the chickens in the yard next to the garden. On Mother’s Day, though, the focus was on flowers, not on vegetables. Every year we’d get up and make breakfast for her (although she never liked to eat it in bed). After presenting her with our gifts, we’d hop in the car for a tour of the plant nurseries in town. Mid-May in Anchorage is still fairly cool, and it was so pleasant to browse through the huge, humid and fragrantly warm greenhouses, admiring the beautiful varieties of annual flowers and hanging baskets. My brother and I were always allowed to pick out a couple of six-packs of annuals to plant in our own little flower gardens. Even though our little flower patches would get rather weedy toward the end of the summer (we were sick of working in the vegetable garden by that time, too), each spring brought new excitement for our little gardens. Ben usually picked impatiens of some kind—the neon pink or orange varieties, and would then plant lots of nasturtiums from seed. My mom loved when I picked allysum, those mounds of tiny white flowers that smell much more beautiful than they look. We thought it was neat that their name was like mine, and I would usually get some pansies to plant along with them. Of course my mom would always plant lots of flowers from seed, too—cosmos and snapdragons, lobelia and marigolds to fill hanging baskets and planter boxes. And when she would inevitably have many more seedlings to transplant than she could possibly use, she could never throw them away, but distributed them to her friends and neighbors. While I don’t plant many annuals (and Dan is in charge of our small vegetable garden), I do love my perennial garden. Some of the flowers are already beginning to show some buds! I’ll write more about that later, though. For now, I’m wishing you and your mothers a very Happy Mother’s Day! This is one of my favorite recipes of my mom’s. It’s garlicky and complex from the wine, but it’s not overly rich, since there isn’t any cream in the sauce. My mom used to make it with her home-made canned clams, even though she didn’t particularly care for clams! Is that true love, or what? I’ve never made it with commercially canned clams, but it’s wonderful with fresh or frozen clams, as well as with home-canned. Even though I’m not a fan of clam chowder or fried clams, I love this recipe. I’ve served this dish to several clam skeptics with great success! I think you’ll really enjoy it! To complete the meal, just add a simple green salad. I have a meat grinder attachment on my KitchenAid mixer that I sometimes use to grind the clams if I’m doing a lot of them at once after a successful clam-digging expedition. I don’t have the patience or the huge pressure-cooker to can the clams like my mom did, but it works just fine to freeze them instead if you have more than you’ll eat all at once. If we don’t come home with many clams, sometimes I just freeze the clams shucked and whole. In that case, I chop them by hand just before I make this dish, when they are still partially frozen, and then when I add the white wine to the clams in the saucepan, I blender them up finely with an immersion blender. You could also do this step in a regular blender. 1. Boil a large pot of water for the pasta. 2. Heat the olive oil in a large frying pan. Saute the garlic over medium heat until golden brown. 3. Add the clams and their liquid (if the clams are raw, there won’t be any liquid), the oregano (pulverize it between your palms as you add it), and the white wine. If you haven’t ground the clams finely yet, do this now with an immersion blender or regular blender. Cook over medium-high heat until the wine is thickened and reduced and the clams are nicely saucy, but not too runny. 4. When the water boils, add salt and put the pasta in to boil. 5. When the pasta is cooked, drain it and pour it into a large bowl. Pour the clam sauce over the top of the pasta, more or less covering the center part of the platter. Sprinkle the parsley all around the edges of the pasta to make a thick moat, and cover the clams in the middle with Parmesan cheese. Grind pepper over the top of the clams. 6. Serve immediately, tossing the pasta at the table, making sure each person gets lots of parsley and clams. Pass additional Parmesan cheese at the table.